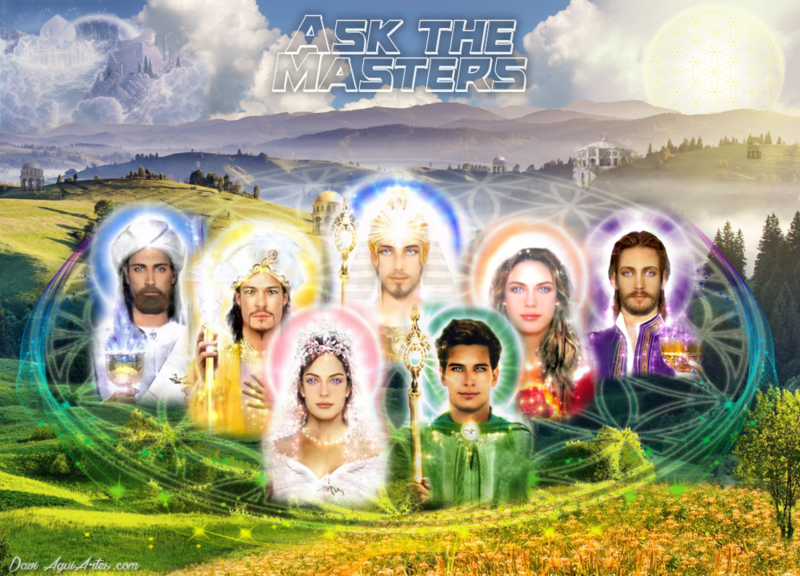 Beloved Ascended Masters! Beloved Master Jesus! Gratitude for this opportunity. I am going through a process of many pains in my physical body. Every time I get better from one pain, other pains appear elsewhere and this makes me very depressed. And all the time it happens, I'm so scared of dying. This thought is recurrent in my head, and I would like to receive help in order to overcome this fear. I sometimes think that this fear of dying has to do with other incarnations. How can I overcome this fear, Masters? Gratitude for your immense love, always. My beloved sister, I am Hilarion, your brother of love. I come on the wings of wisdom to impart peace and completeness. Be anchored in your heart right now. Be in love, open yourself to receive the best, just this and nothing more. How many are those, my sister, who, in the doubts of the journey, ceased living them to surrender to the process. Know that everything you feel is natural, but the fear you hold inside. For when you open yourself with acceptance to the process, in trust to God, the process will become softer. For the physical pains you feel are the symptoms of resistance to the path. Imagine, my sister, someone is on a road, walking to a destination. There is a lake next to them, with very beautiful trees that they can look at and enjoy the ride. But they can also look at the sun's heat and the image of the long road ahead. The decision is yours, enjoy the ride and continue to walk or focus on the heat of the sun and having to walk the same way. Everything, my sister, is a matter of focus on what you do. When you maintain these fears, you generate resistance and you feel pain. How many Masters did not finish the road because they did not know how to look the way. Because the focus on the sun ends up making the road harder. Release the fears, know that the process is like this, and allow, as I do, that life be lived on the wings of wisdom. This is the process and its purpose is for you to accept. Practice HO'OPONOPONO in your life and thank for life and nothing more. Be in peace. I appreciate the opportunity. I've been through hard times. Suddenly I've had panic attacks that were very scary. I was afraid of going mad or losing touch with reality, and even of dying. I felt as if I could be snatched from my body and everything around me seemed like a strange dream. I am not having those crises anymore, I've been praying and treating my anxiety and depression with holistic therapies, and seeking to anchor myself in spirituality and trust in my path, but I still have this strange feeling of fear and insecurity and disconnection from the reality. As if I did not understand human existence, I can't understand what is beyond it. I feel I do not belong here. I feel lonely and I do not know where I belong. I am afraid that I do not know what to hold on to, since I know that this human world is not "real", but still being human, and trying to understand something that is beyond human comprehension, I'm getting confused. I feel like I'm going through deep changes, as if I were changing dimensions. Sometimes I can feel myself calmer, but it is still a difficult period, with oscillations, sometimes fear overwhelms me and my mind leads me to doubts and very bad thoughts. I wonder what can be happening and how I can get some comfort. Thanks for help. Greetings, my daughter! I am Ogun, orixá of the orixás, warrior of the life and the death. Worker of Christ and through Christ. I am your brother, who accompanies you on the way, to protect you, even if you do not know. Save the strength of the Orixás, hail the greater force! My daughter, Ogun is with you to hold you, support you and welcome you. Ogun is the brave warrior who holds the children in the hour of despair. This is my duty, to hold, to support and to keep myself centered in the hardest moments. Because I am a warrior and I do not give myself to life. Thus God conceived me and thus I accept my mission. I work on the line of the Exu, all strong warriors of love, who protect the children clad in the illusion of material life. They come into life as if it were everything. Our line of workers is tireless in the greatest protection of children. Save the strength of Ogun, who manifests in his own strength, my sister. The Orixá that comes to meet you now through these brothers, tell you that there is nothing in this world that is not planned, and that all these pains that brings within you, are pains that you accepted to receive in your genetic inheritance, although you must overcome them. You have accepted the challenge of infiltrating these fears, precisely because of your ability to overcome, by your strength that is based on Ogun's strength. Oh, daughter! Bring the strength of Ogum to your being, call for the legion of Exu, benevolent light beings, all ready to support you in the hard tests you have chosen. Save the greater force, Hail Christ who is the unity of the greater force! I sometimes feel like I'm well connected. I'd also like to know about my mother, I would like a message from her if I could, I'm sorry, nearby Presence. Once again thank you for your availability. Daughter. It is with much love that I bring this message to you. It is daily seeking your own overcoming, the inner transformation into peace and into unity with the All. You are always accompanied by good energies, but like so many others, you work for the release of past constraints, which prevent you from being fully happy. Perseverance in peace will only be obtained from the moment you give up your yearnings, when you stop waiting for something, which includes connecting with your mother. This is just an example, but it is something that shows perfectly how you lead your life, in expectation that something will happen, what truths to reveal and what dreams to come true. These are the only obstacles that keep you away from the fullness, and keep you away from living in the present. Just go through cultivating in your heart the acceptance of all that is offered, without expectation and also without feeding dreams in the mind. Let life, just as it presents itself, shine in joy and peace, since you know that happiness and constancy in good energies is something that can be perfectly achieved right where you are at that moment. Life is a perfect daughter, just as she presents herself to you. Carry on with my love in your heart. Dear Master friends, thank you for this opportunity to speak with you. Brethren, this doubt is always on my mind lately: what is my talent? I like many things, but I do not know what my passions are, I do not know what I'm good at. Given this, doubts arise, for example, the area of Law (course in which I graduated), are competitions in my purpose of life? I have been interested in the holistic area, I'm even attending some courses, but I am uncertain whether I have the gift of healing or not. I really want to improve my financial life and be able to give my family more comfort, they have always supported me so much and I feel guilty because I still can not return it to them. Gratitude, for always being with me. Daughter, I greet the inner god who dwells in you. As well as I love you as a daughter, and I am here to show you the way of the heart. Just silence, stay connected inside. You already do that, daughter, you just need to trust the information that comes to you in this state of fullness and peace. You, following the path indicated by the heart, by the connection with the I Am, will end up being brought to your purpose in this life, which is not awakened by fear and necessity, nor even by scarcity. But it will be the purpose that will make you fully happy. All of us and all of you, have the gift of healing, after all we are god in creative seed. We are cradles where divine gifts are generated, be of healing or so many others, but which are awakened only when we allow this voice of the heart to be heard. HOW DO I KNOW IF I SHOULD END A RELATIONSHIP? Dear Masters, thank you for all the love you have poured over us, you have been very helpful to me. And I thank those channels who do this divine work. I apologize for bothering again, but I am in a loving relationship, and the question is: how do we know if we have to go ahead and leave everything behind, or if we should stay and try to grow together? I feel joy and peace in sharing the learning with him. But I sometimes feel that I am deceiving myself and that I am in a utilitarian relationship, other times I think it is part of my learning to learn how to love unconditionally. The fact is that this indecision before little clarity is making me very confused. I need your enlightened look, I ask you to send Light so that I can see what I need to see and I can make the decision with a quiet heart. Love you. I want love to flow through me. Daughter, what you feel for your mate is love. But you are able to extend this love to yourself too. Therefore, unconditional love must also be exercised by you, towards yourself, and free yourself from the demand of sending that love to others, without even allowing it to be born within you. The first step to truly feel unconditional love is to free yourself from the demand, and to love yourself. Daughter, we will not give you the answer, when you decide which way to go, you must be prepared to face your decisions, and so we will always be by your side dedicating our love and strength so you persist in your purpose, the purpose of inner search and self love, for it is only this way that you will attain the feeling of unconditional love. WHAT WORK WILL FULFILL MYSELF PROFESSIONALLY? Good morning, dear Masters! Thank you very much for being able to ask this question. I have just moved to live with my boyfriend in a city far from my hometown. My mother does not accept this situation very well. She is very lonely and there have been times when I lived far away and I ended up coming back mostly because of her. I do not want this to happen anymore. I want her to find her way and be happy. But she is very resistant to it, and defines the whole situation as if she could not be happy with me living far away. This becomes a heavy burden for me. How should I deal with this situation? I have another doubt, which is about my professional life, since I am a lawyer, but I have no longer done this particular job. But I feel that I should return to work with Law, because nowadays I do not feel that I do useful work for society. I have always dreamed of working on something that I believed and could help people with. But I feel like I have not found that job yet. How do I find out what to work with and what work will fulfill me professionally? I'm thankful to you, Masters, whom I feel to be always present with me, and help me so much. Gratitude! Greetings! The daughter, with all the love she gives her mother, ends up preventing her from walking the path of her own liberation. Keeping her from looking at her own pain, trying to cover her wounds with her presence and offering herself, in a way, as her emotional crutch, prevents her from actually looking into herself and discovering what the makes her suffer. Beloved daughter, as long as you remain aiding your mother, you will, in fact, be preventing her from her walk of liberation of her inferior aspects which she chooses not to look at. It is painful, yes, much more to her than to you. But precisely you will find your purpose when you are far from her, when you open your own life to flow. Allow her to have her own learning, to face her own restraints, to look into herself, since this is something she can not escape from, she is being led to remain alone precisely so that that inward look can occur. And you, dear child, remain in peace, in the certainty that you send all your love to your mother, and that you can only truly help her when you distance yourself. Your walk begins now, daughter, go in peace and calmly, follow the heart. Pay attention to what your intuition says, and then you will be guided to what will make you happy professionally. Just follow the call of the heart, trust. We love you and we are with you on this journey. Peace and light. Messengers: Thiago Strapasson and Michele Martini - April 2017.